The easiest and least expensive way to order premium quality pipe & drape products (and pipe and base kits) anywhere on the web! Pipe and drape backdrop kits, trade show booths, and portable photo booths are our specialties! We supply hotels, conference centers, schools, trade shows, churches, party rental stores, and many other businesses with our complete pipe and drape packages, as well as parts and accessories for existing displays. Places of worship use pipe and drape for services, ceremonies, and performances. Colleges and schools use pipe and drape for sporting events, class reunions, and many other school related functions. Wedding halls use pipe and drape for both the ceremony and reception -- think wedding canopies, backdrops behind the head table, and covering the venue walls. Convention centers use pipe and drape to create eye-catching trade show booths when hosting trade shows or job fairs. Businesses use pipe and drape to hide construction on their premises, or to re-enforce corporate colors wherever they go. Photographers use pipe and drape for the background of photo shoots, or to make a portable photo booth enclosure. Hospitals use pipe and drape to create private dressing rooms for patients waiting to go to their room. Shopping malls use pipe and drape as quick kiosks that can quickly be transported to any area of the building. The list can get quite lengthy, but these examples are just a few of the MANY ways that pipe and drape is utilized in everyday life. Why do they choose pipe and drape? Because pipe and drape makes life simple! Consisting of only steel bases, aluminum pipes, and fabric, setting up a pipe and drape display requires no special skills or complex tools. In just a few minutes, you've created a beautiful display. Best of all, it's a temporary structure that is completely portable...ready to move to the next room, or even the next state, whenever needed. Pipe and drape saves time and money! You host several functions each month, and each event can have a different color scheme that blends everything perfectly. Problem is, your walls are white. Or ivory. Or any other color. What can you do? Well, you could paint the walls EVERY TIME, spending $25-$40 per gallon of paint...not to mention the time that it takes. Or, you can set up pipe and drape in no time at all, with little effort, and simply switch out the drape colors for each event. Easy choice! Pipe and drape transforms space! Say you have a big room, but a small event. With pipe and drape, there's no need to have 15 people sitting in a huge space normally reserved for a 100 people! Put up some pipe & drape and transform that large room in to a more intimate area. Pipe and drape looks great! In a public venue that is undergoing construction and renovation, it can be a real eye sore for clients or customers to see the work being performed. Put up some pipe and drape and keep them concentrating on the important things, not the wall that is knocked down with wires running through it! Because of these reasons, you see pipe and drape being used all the time! If you see a press conference on TV -- whether it's a political speech, post game interview after a sporting event, etc. -- keep an eye on the background behind the speaker. Chances are pipe and drape is being used as the backdrop. Ever been to a trade show? If you've never noticed before, take a look around next to see how pipe and drape easily allows vendors to have their own booth space. Next time you attend a wedding (or congratulations if YOU'RE the one getting married! ), keep a lookout for pipe and drape being used at the venue. Many schools use pipe and drape throughout the year for graduation ceremonies, performances, dances & parties, and faculty functions. Athletes in sports organizations will often breeze past pipe and drape in their team colors as they go through the tunnel. There's pipe and drape being used everywhere! Next time you're out and about, take a look around. "Thank you again for your prompt response, and your great customer service. You saved me $273 from another quote, so our small community theater is very happy!" "I just put together my booth, I was amazed how quick it arrived! And the drapes look elegant, not cheap. Thanks for American products and American companies." "After a fruitless search for pipe and drape in my area, (LA out of all places), I found your wonderful site and I couldn't be happier. Even though there were other sites on the net, yours was the easiest to navigate, the prices were right up my alley, and checking out was easier than my local supermarket. My order arrived in a timely manner, the quality of the product is top notch, and the pipe and drape took me less then a few minutes to set up. I would highly recommend you to anyone looking for pipe and drape products. I will return in the future for all my pipe and drape needs." Our complete pipe and drape packages / kits eliminate any guesswork (everything you need is included in each package). Don't need an entire package? No problem! Component parts are offered if you don't need an entire kit, or if you would like to build a custom set-up. Our slip fit system makes installation quick and easy. We have the absolute best prices for high quality pipe and drape, backed by our PRICE MATCH GUARANTEE (see details). Most of our products are made or otherwise fabricated in the USA! Our FREE SHIPPING (see details) helps you stay within budget. Premium quality pipe and drape backdrop displays and trade show booths at the lowest prices anywhere. So take a look at our selection of Complete Backdrop Kits, Component Parts & Accessories (from Uprights, Bases, Drape Support Rods, and Drapes that include Banjo, Premier, Voile, Commando, and Velours), Crowd Control Stanchions, and more. You can also rest assured that we provide exceptional customer service. Let us know if you need any assistance. Our customer service representatives are more than happy to help! At Pipe and Drape Online, we're here to help you create absolutely AMAZING events with our selection of premium-quality pipe and drape supplies, elegant backdrop kits, and other event décor. 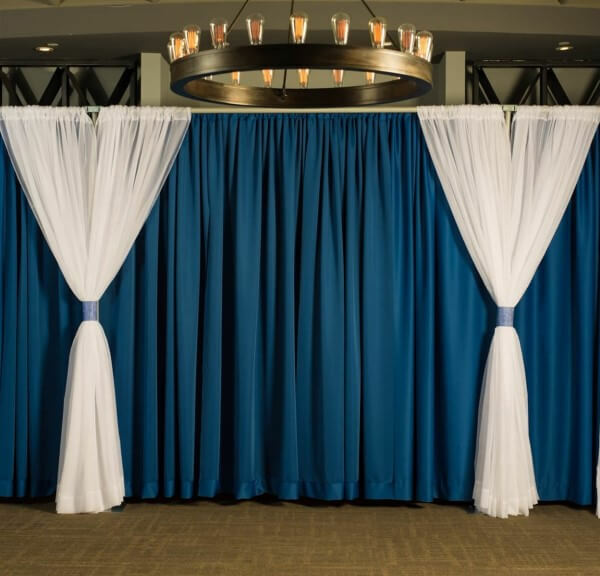 With our pipe and drape kits and accessories, you’ll have an easy way to transform the look of any space. Divide a room, cover a wall, or create a stunning focal point. Turn an ordinary setting into a scene straight out of a fairy tale. Plus, it's portable, reusable, quick to set-up, and easy to take down after the event. That means you can use our pipe and drape kits to create temporary displays that can be set-up in tons of different ways, and in tons of different places. Changing the look is as easy as changing the drapes! We also carry an assortment of other event décor that is designed to elevate your space to the next level. Take a look at our Ceiling Drape Kits, Crowd Control Stanchions, and Table Linens for inspiration! As one of the nation's largest manufacturers and distributors of pipe and drape supplies, you'll find that we have the look you need at a price you'll love. So whether you're searching for photography backdrops, wedding drapery, room dividers for your church or place of worship, portable photo booths, or you’re filling up an expo space with pipe and drape trade show booths, we’ll help you make any space look amazing! If you have any questions regarding our products, please don’t hesitate to contact us. We look forward to helping you find what you need to create the event of your dreams!